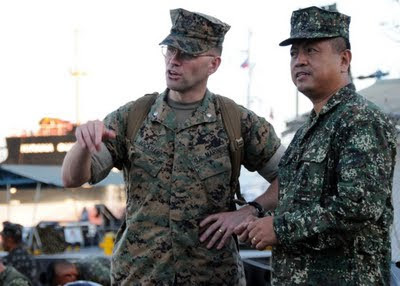 SUBIC BAY – Marine Corps Lieutenant Colonel Stuart Lockhart, executive officer of the 31st Marine Expeditionary Unit, interfaces with Republic of the Philippines marine. Lieutenant Colonel Stuart R. Lockhart was born and raised in southern New Jersey, graduating from the United States Naval Academy in 1991. Commissioned a Second Lieutenant, he completed The Basic School and the Infantry Officer's Course (IOC) and was assigned to the 2d Reconnaissance Battalion, 2d MarDiv in Camp Lejeune, NC, for duty as a platoon commander. 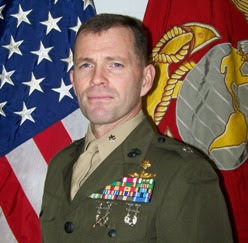 Following his tour with 2d Reconnaissance Company, Lieutenant Colonel Lockhart was reassigned to the 3rd Battalion, 8th Marine Regiment for duty as the executive officer. After completing a deployment with the 24th Marine Expeditionary Unit (Special Operations Capable), he was transferred to the Marine Corps Recruit Depot at San Diego...in the Recruit Training Regiment as company commander. Lieutenant Colonel Lockhart attended the U.S. Army's Armored Officers Advanced Course. Lieutenant Colonel Lockhart departed 3/1 in August 2001 to begin his graduate studies at Temple University in Philadelphia, Pa., under the Advanced Degree Program (ADP). Completing his Masters of Arts in Military History in December 2002, he was assigned as an instructor in the History Department at the U.S. Naval Academy. I want to thank you very much for your note and I am indeed interested in the recovery of Lt. Richard Somers' remains. Being a native of South Jersey, I grew up listening to the stories of our area and my father, a former naval officer and naval history enthusiast...impressed upon me at an early age the events of the Barbary Wars, from the destruction of the Philadelphia to the role played by Lt. Somers. Also, I read the story that was placed in the Sentinel last year that described your efforts and, at the time, I meant to contact you. With the busyness of my billet here, I was remiss...I want to thank you for taking this step! I can tell you that your article has been a topic of note in my "American Naval History Class" since I saw it last year. In fact, a copy of it is taped to my office hatch for midshipmen and fellow faculty to read. The wars of the early Republic are, of course, the source of nearly a day's worth of material in this class. I think the case of Richard Somers, and those sailors lost on the Intrepid on 4 Sept, 1804, serves to show just how our history remains a part of us, and how a relative "footnote" from our past can still be important today. Also...it shows to what lengths our nation will go to preserve those lost in its service. Again, my hats off to you, Mr. Kelly! As you know, Richard Somers and his fellow officers lost in the Barbary Wars of 1801-1805 are especially important here at USNA. The Tripolitan Monument rests yards from my office and it reminds us of the courage of the men who died in one of America's first overseas conflicts. You mention Wadsworth and Israel...I'm sure you know that Stephen Decatur, Jr's younger brother is also represented on the monument. In many ways, Decatur's exploits in this war and afterward overshadowed those of Somers. Unfortunate...but at least his memory has lived on in other ways. Once again, Mr. Kelly...please keep me informed as to the continued developments and when, in the future, the reinterrment will take place. I would love to attend this event. Also, let me know if I can be of any assistance to you. PS: My wife is interested in this story as she is a USNA graduate also, and a Linwood native! Master Commandant Richard Somers, hero of Barbary Wars, links two towns in different states. A delegation of city residents from the town of Somers Point, NJ traveled to the hamlet of Somers, New York on Saturday, June 25, to receive a key to the town from Somers’ Supervisor/Mayor, Mary Beth Murphy. The ceremony took place during an annual July 4th celebration held at the town’s Reiss Park. The members of the group from Somers Point, N.J. included Sally Hastings (President of the Somers Point Historical Society), her husband Kirk Hastings, Dean and Vickie Somers, Anita Smith, Somers Point Mayor Jack Glasser and his son, Jack. On hand in Somers, N.Y. were local Historical Society President Emil Antonaccio, Vice-President Grace Zimmermann, and Joseph Wittman, Jr., President of Ivandell Cemetery. 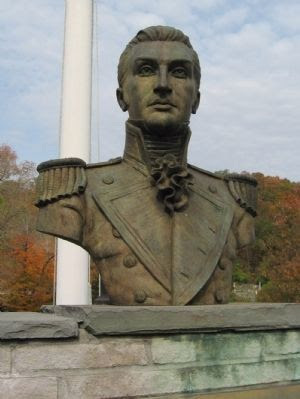 Somers, N. Y. is located in northeastern Westchester Country, and is named after Richard Somers, a naval hero who was killed in Tripoli, Libya in 1804 during the Barbary Wars. A bust of Somers is located in Ivandell Cemetery, a local burying ground that predates the Revolutionary War. Originally called Stephentown, the N.Y. hamlet was renamed in Somers’ honor in 1808. Somers was born in and grew up in Somers Point, N.J., and it is this fact that has caused the tow towns to recently develop an unofficial ‘sister city” relationship with each other. Dean and Vicki Somers, who were part of Saturday’s celebration, claim Richard Somers as one of their ancestors. There is currently an effort underway in the nation’s capitol, backed by the national American Legion organization, to have Richard Somers’ body returned to the U.S. It is currently interred in Tripoli, Libya. After the Saturday ceremony, the group from Somers Point was given a bus tour of Somers and its environs, which encompassed an area of 33 square miles and includes the aforementioned Reis Park, as well as the Wright Reis Homestead, the Amawalk Reservoir, Muscoot Farm (an early 20th century interpretative farm museum), and the Elephant Hotel. The Elephant Hotel, a National Historic Landmark, is named after “Old Bet,” one of the first elephants ever exhibited in the United States. Somers’ municipal government and Historical Museum are both currently located inside the hotel. Somers is known for being the “cradle of the American circus,” after Hachaliah Bailey bought Old Bet there from Africa in the 1820s. The elephant died in 1827. A group including Mary Beth Murphy, from Somers, N.Y., is planning to travel to Somers Point, N.J. in September during the city’s annual Richard Somers Day celebration, to accept the key to Somers Point as well. Before he perished in the explosion of the USS Intrepid, the last thing Richard Somers saw was the outline of the ancient red walls of the old castle fort that stood out along the waterline on the horizon, just as it does today over two hundred years later. 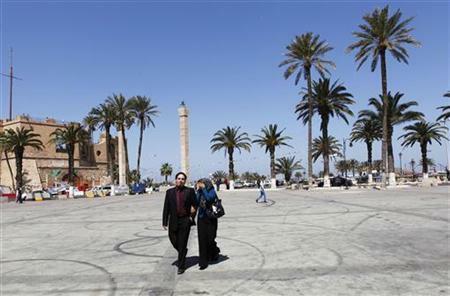 In Tripoli, two centuries is like yesterday, as Roman emperors walked through the same ancient arches two thousand years ago, when the fort’s foundations were already a thousand years old. It was from the fort’s ramparts that many battles were fought, including the US Navy’s attacks against the Tyrant of Tripoli, Yousef Karamnali, who was defeated in battle but permitted to remain in power by a treaty that he repeatedly broke. A hundred and fifty years later Beneito Musellini gave speeches from the ramparts of the fort and Nazi general Irwin Rommel plotted his North African strategy in the shadow of its walls. Master Commandant Richard Somers and the 12 officers and men of the USS Intrepid are also buried outside those walls in a grave that was partially disrupted by an Italian army road work crew in 1930. They discovered the remains of five of the men and reburied them in crypts at a nearby walled cemetery. In 1949, when the USS Spokane put into Tripoli, they honored the men by conducting a ceremony that included the mayor of Tripoli, Yousef Karamanli, a descendent of the pirate king who Somers had fought a hundred and fifty years previous. 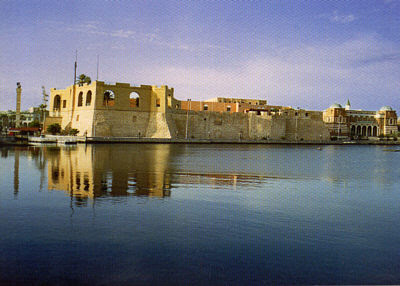 As the walls of the old red castle fort are now on the horizon again, ground zero in the revolutionary battle of Tripoli in 2011, we are reminded that Richard Somers and the men of the Intrepid are buried there, in the square outside the walls of the fort that is the epicenter of the revolution, Martyr’s Square. The only martyrs actually buried there are Somers and the US Navy heroes who once fought for the same ideals that the Libyan revolutionaries say they are now fighting for – liberty, freedom, justice and democracy. But who was Richard Somers? And what can we learn from him today? 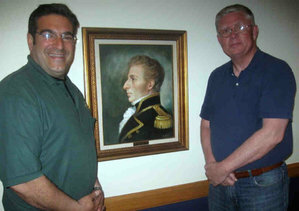 Greg Sykora (left) and Somers Point, NJ Mayor Jack Glasser stand by a portrait of Master Commandant Richard Somers in Somers Point City Hall. Jack Glasser, mayor of Somers Point, NJ , asks why the remains of U.S. Navy heroes are still buried in Libya. Being the mayor of this town I’ve got a passion for this. As a veteran I can’t understand why they are still there in Libya. For the life of me I cannot understand why we’ve left them there for two hundred and six years in Libya. We had the country at one time, why didn’t we bring them back? But in this town, not only I, but there are so many people in this town and the Somers family that have the passion to bring the crew of the Intrepid home. It’s time to bring them home, that’s my saying. It’s time to bring them home. We have congressman Mike Rogers from the great state of Michigan and our own congressman Frank LoBiondo, who has championing this cause in Congress for many years, introducing bill 1497 in Congress to bring the crew of the Intrepid home. It’s time for our government get on board with this, to use a Navy saying, to get on board with this and stand behind us and bring them home. I understand that there are Americans lying in foreign soil in France and Germany and other places, but those countries have always been our allies. Richard Somers and his crew of the Intrepid are lying in a hostile country, hostile towards us for many years - bring them home to the United States. It’s the right thing to do. If I seem compassionate, I’m not, I just feel really deep down, that it’s not right for them to stay there. We need to have our heroes, and again, I firmly believe would be a Medal of Honor winner, we need to have them brough them home to the United States. We are lucky there are other people – Sally Hastings, Walt Gregory, Greg Sykora, all these people in Somers Point are like minded, like me - Bill Kelly, Mike Caputo, Chip Reid and especially the family - Dean Somers, Andrea, who works here, a relative, all these people feel the same as I do – we need to bring them home. As far back as 1850 when James Finemore Cooper wrote in his book that the Somers family members wished to have Richard Somers and the crew brought home. We’ve been at it for so long, and I just can’t understand why. With so much going on there, once the political situation stabilizes, I would hope that our government firmly stands behind this initiative, and puts everything into place. And we have the resources because we have done it in other countries – from World War II, Korea and Vietnam. We have the resources to do this, let’s put those resources to work and bring them home. A House of Representatives amendment that supports bringing home the remains of U.S. Navy heroes from Libya has no counterpart in the Senate's version of the National Defense Authorization Act (NDAA) for fiscal 2012. While the Senate Armed Services Committee chose not to address the issue, the House passed an amendment (H.R. 1497) on May 26, directing the Secretary of Defense to take whatever steps necessary to "exhume and transfer the remains of certain deceased members of the Armed Forces buried in Tripoli, Libya...."
Those "deceased members" died on Sept. 4, 1804, in the harbor of Tripoli when an explosive-packed ship they crewed, the Intrepid, blew up prematurely and killed all 13 men on board, led by Master Commandant Richard Somers and his second-in-command, Lt. Henry Wadsworth (uncle of the poet Henry Wadsworth Longfellow). The sailors' remains were discovered onshore the next day, abused by the enemy and partially devoured by a pack of stray dogs before Capt. William Bainbridge and other Navy prisoners in Tripoli were allowed to bury Somers and his men. More than two centuries later, those American heroes lie buried in a hostile land. The American Legion's National Executive Committee passed a resolution in May that urges "the President and the Congress to support legislation and policies that will use all reasonable resources to achieve the fullest possible accounting of all missing American servicemembers, regardless of location or era of loss." Tim Tetz, the Legion's Legislative director, wrote a May 24 letter to House Speaker John Boehner, asking for his support of H.R. 1497, authored by Reps. Mike Rogers of Michigan and Frank LoBiondo of New Jersey. "There, within a forgotten cemetery, lie the remains of an American naval hero, Master Commandant Richard Somers, whose legacy inspires those still serving in the Navy," Tetz wrote. "There lie remains that family members have pled to have returned to the United States. "It is therefore the opportunity and - more importantly - duty of Congress to direct that we recover the remains of those Americans within Tripoli.... The time has come to bring our heroes home." Michael Caputo has been lobbying on behalf of the Somers Point community to get the Intrepid crew's remains back to America. "They aren't lying in a Normandy-style hallowed ground. Some are in a ratty, unkempt cemetery and others lie jumbled together underneath Green Square," where Col. Muammar Qaddafi and his government hold public rallies. "These men didn't get an honorable burial; they were dragged through the streets, fed to wild dogs and dumped in mass graves," Caputo said. "But the most important reason to bring them back is because their families have wanted them home for more than 200 years." Caputo is a member of American Legion Post 362 in East Aurora, N.Y.
Jack Glasser, mayor of Somers Point, N.J. (founded by the naval hero's ancestors) is part of an ongoing local effort to retrieve the remains of the Intrepid crew. "As a veteran, I can't understand why they're still there," Glasser said. "For the life of me, I cannot understand why we've left them there for 206 years in Libya. It's time to bring them home." Glasser retired from the New Jersey Air National Guard with 20 years of service. Although Somers has had six U.S. Navy ships named after him, and a monument honoring him and his crew stands at the U.S. Naval Academy, the United States has never reclaimed the Intrepid crew's remains from Libya. Sally Hastings, president of the Somers Point Historical Society and Museum, said historical documents indicate family members tried to get Somers' remains back to America in the early 1800s. "Two centuries later, the story of Richard Somers and the crew of the Intrepid is not complete," Hasting said. "There is more to come. Ultimately, the Somers Point Historical Society will be the organization that plans any local burial of Richard Somers, with the assistance of the city and - I would hope - veterans groups." Hastings and her organization have taken a leading role in building support for their cause, raising funds for a monument to Somers, and planning the ceremony for its eventual dedication at Somers Point. "Any servicemember killed in the line of duty deserves to come home," said Barry Searle, director of the Legion's National Security/Foreign Relations Division. "First, it is important for family members to have their loved ones properly buried in an environment that isn't hostile. "But bringing Somers and his men back home is also a matter of national honor and trust. By making this effort, we are telling future generations that the United States stands by its commitment to those who serve in uniform." As for an amendment of support being excluded from the Senate's version of the NDAA, Tetz said The American Legion will still have the opportunity to press for its inclusion on the Senate floor. "And we fully intend to do that if need be." To help with efforts to repatriate the remains of Somers and the Intrepid crew, go to the American Legion web site - http://legion.org/legislative/140074/13-us-sailors-remain-buried-libya click and sign the petition. To learn more about Somers and the Intrepid's mission. Labels: "It's time to bring them home." 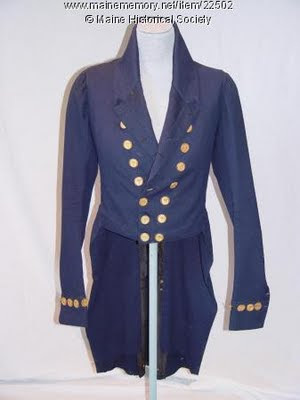 Description - Lt. Henry Wadsworth of Portland wore this coat while serving with Commodore Edward Preble at the Battle of Tripoli in 1803. Wadsworth was the son of Peleg and Elizabeth Wadsworth. Noted poet Henry Wadsworth Longfellow was named for this uncle who died before the poet's birth. Preble, also of Portland, commanded the American fleet during the Barbary War. WASHINGTON -- There is a monument to Lt. Henry Wadsworth in Portland's historic Eastern Cemetery, but the remains of the uncle of the famous poet are thousands of miles away, in an unmarked grave in Tripoli. As the United States again finds itself in armed conflict in Libya, an effort is being made privately and in Congress to repatriate the remains of Wadsworth and 12 other sailors who were killed in what is known as the First Barbary War. The cause has been championed for years by a nonprofit group called the Intrepid Project, named for a ship the United States used in the Mediterranean to combat Tripoli's pirate ships, which were attacking U.S. merchant vessels during the First Barbary War. The cause was taken up in Congress by Rep. Mike Rogers, R-Mich., chairman of the House Permanent Select Committee on Intelligence, who learned of the remains of the Intrepid's sailors in 2004, during a visit to Libya to examine weapons stockpiles. Legislation by Rogers calling for the United States to repatriate the remains -- after the current conflict with Libya is over -- was passed by the House earlier this year as part of a broader defense bill. The Senate did not include the legislation in its version of the bill, which was approved last week by the Senate Armed Services Committee. That could change when the bill reaches the Senate floor later this year. Sen. Olympia Snowe of Maine is among the senators who are considering taking up the Intrepid repatriation cause. "Our fallen heroes deserve our utmost respect and gratitude for making the ultimate sacrifice on behalf of our nation," Snowe said last week. "Working to respect the wishes of these men's families, we must ensure their final resting place is a fitting tribute to their service." The Intrepid Project and the American Legion, which backs the repatriation effort, are lobbying senators from other places that were home to the Intrepid's sailors, including New Jersey and New York, to introduce or support repatriation legislation in the Senate. The Intrepid Project is run by Michael Caputo, a public relations executive who learned of the campaign from the family of the Intrepid's commander, Richard Somers, and others in Somers Point, N.J.
Wadsworth was killed in 1804, while he was second-in-command on the Intrepid. His sister was Zilpah Longfellow, the mother of Henry Wadsworth Longfellow. The poet, a Portland native whose family's home is now a museum on Congress Street managed by the Maine Historical Society, was named after his uncle. 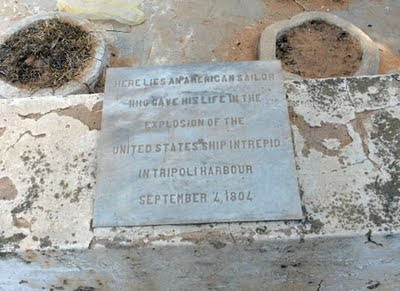 The Intrepid tried to sneak into Tripoli's harbor on Sept. 4, 1804, and blow up pirate ships, but all 13 aboard were killed and washed ashore. Their bodies were dragged to the streets and fed to wild dogs, then buried in unmarked graves. 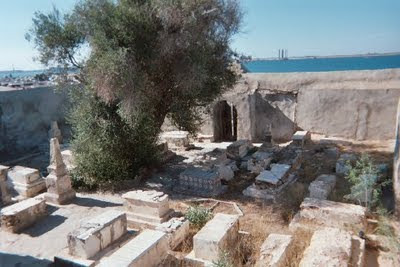 Five of the enlisted men's remains are in a dilapidated cemetery in Tripoli. Wadsworth, Somers and one other officer from the ship, along with the other enlisted men, are in an unmarked grave beneath what is known as Green Square, where strongman Moammar Gadhafi and his supporters have held anti-American rallies, Caputo said. "The loss of the Intrepid played a dramatic role in the first international test of the American Navy and it was a major blow for the Wadsworth and Longfellow families," said Richard D'Abate, executive director of the Maine Historical Society. D'Abate said there are many unknowns in the effort to repatriate Wadsworth's remains, including whether they can be accurately identified and whether permission can be gained to bury them, if they are identified, in Eastern Cemetery. "If Henry Wadsworth could be identified and brought back to Portland, that would be a fine thing," D'Abate said. Proponents of the legislation say they believe DNA testing could be used to identify the remains. They hope to get permission to use the DNA of a living Wadsworth descendant for that purpose. Joe Dumais, parks and cemeteries coordinator for the Portland Public Services Department, said the city can't give definitive permission to bury Wadsworth's remains, if they are identified and brought back, until more research is done, but the prospect is "exciting and a great idea." Caputo said he plans to take the repatriation campaign to Maine this summer to continue drumming up support among Maine lawmakers, history buffs and perhaps Wadsworth's descendants. Caputo said he got the "fever" for repatriating the Intrepid sailors' remains when he was living and working on a project in Somers Point, a town named for the Somers family, and learned of the story during the annual commemoration of Richard Somers. Caputo said he served in the Army from 1980 to 1983 and feels that leaving the remains where they are, even after more than 200 years, "is a despicable way to dispose of the remains of bona fide war heroes." He said that in 2006, during negotiations with the Gadhafi family initiated by his project and the Somers family, remains were unearthed that revealed "brass buttons and bones." Rep. Rogers said by email that the Navy wants to leave the remains where they are, and considers the graves in Tripoli a final resting place. 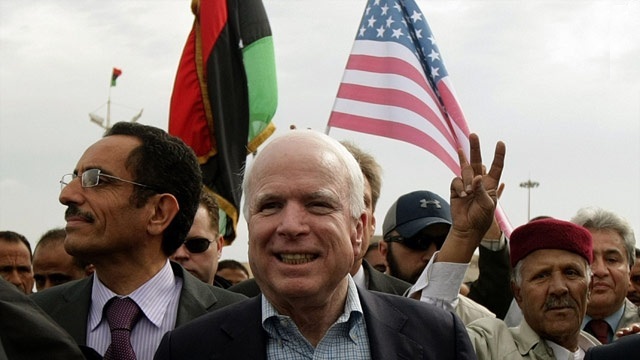 He said that, under his legislation, the repatriation is contingent on Gadhafi stepping down. It would be paid for with Defense Department funds and carried out by an agency that locates and identifies, by use of DNA, veterans of wars such as World War II and Vietnam. It would be an opportunity to establish relations with a new Libyan government, Rogers said, but most of all, "As a former member of the U.S. Army I believe that our country should never leave a fellow American in uniform behind." At the end of Tripoli Road is Martyr's Square, the ancient, red castle fort and the graves of Master Commandant Richard Somers and the men of the USS Intrepid. Master Commandant Richard Somers and the 12 officers and men of the USS Intrepid lie “boots underground,” buried in an unmarked grave just outside the walls of the ancient red castle fort in what they call Green Square, that will be renamed Martyr’s Square after the current revolution is over. They were all volunteers, having joined the Navy to fight pirates, and they’ve been there since the explosion of the Intrepid in Tripoli harbor on September 4, 1804, over two centuries ago. Richard Somers’ family, originally from Somers Point, New Jersey, have always requested and expected his remains to be brought home, and they haven’t forgotten about him, although they sometimes think that US government and the Navy may have. The early efforts of the family have been enjoined by citizens and officials from Somers Point, the town’s historical society and veterans. The New Jersey legislature and the United States House of Representatives have officially called for the repatriation of the remains of these men, and the US Senate is now considering the matter as an amendment to the Defense Authorization Act. The only opposition comes from the top commanders of the Navy, who say that the mission of the men of the Intrepid is not yet over, and that based on the studies and reports, made the official determination that they should stay where they are. In 1930, during the Italian occupation of Libya, an Italian army road work crew uncovered the remains of five of the twelve men, and reburied them at a nearby walled cemetery, Old Protestant Cemetery, that also includes the graves of about a hundred other, mainly European diplomats and their families. These graves are clearly marked, and the cemetery is secured, but the Admiral’s determination only refers to the cemetery graves and does not make a determination on the original grave site at Green Square. Green Square, soon to be renamed Marty’s Square, is where people gather to celebrate or protest, and is from the ramparts of the old red castle fort where great battles were fought, and where Benito Mussolini and Mummar Gadaffi gave speeches. It is also where Master Commandant Richard Somers and seven of his men are buried in unmarked graves, including the other officers – Lt. Henry Wadsworth (Uncle of Longfellow) and Lt. Joseph Israel and five other seamen. Their original mission was to sail the Intrepid, a captured pirate ship, into Tripoli harbor laden with explosives, set her to sail into the anchored enemy fleet, light a fuse and escape in two row boats. But the Intrepid exploded prematurely, killing all hands. Their bodies washed ashore and the next day they were buried by captured American sailors who were kept prisoners in the dungeons of the castle fort. But there they remained, in the shadow of the walls of the old castle fort, until the Italian work crew uncovered five of them and reburied them at the Old Protestant Cemetery, about a mile east along the old coast road. Since they were buried in two distinct graves, one for the ten seamen and the other for the three officers, the five remains uncovered by the Italians must have been from the lot of 10 seamen, leaving five seamen and the three officers still buried at the original grave by the fort. There have been many efforts to repatriate the remains of these men over the years, all unsuccessful because of some political reason or other, but today, the opposition comes only from the US Navy, who say these men are strategically located and can still be of use to their service. Although it isn’t explained in the CNO’s official determination regarding the cemetery graves, the cooperative upkeep of the cemetery site provides for close cooperation between the Libyans, the US embassy personnel and the Navy, giving them a non-threatening issue to discuss, and the beginnings of a cooperation that could lead to other joint projects. While this worked to some extent with the Gadhafi government, it will become paramount to encourage the early and close cooperation between the US officials and the new government of Libya, whoever they are and whenever they take over. That is a sensitive and important mission for the men of the Intrepid, but it doesn’t apply to those still buried at the original grave site at Green Square. When the revolution gets there, and it is renamed Marty’s Square, remember the men of the Intrepid who are buried there. Once the situation in Tripoli is stabilized, their mission will then be over, and the first issue that the United States should bring up in their negotiations with the new Libyan government should be the repatriation of the remains of the men of the Intrepid. Blowing Up of the Fire Ship Intrepid Commanded by Capt. Somers in the Harbour of Tripoli on the night of the 4th Sepr. 1804" Contemporary line engraving. 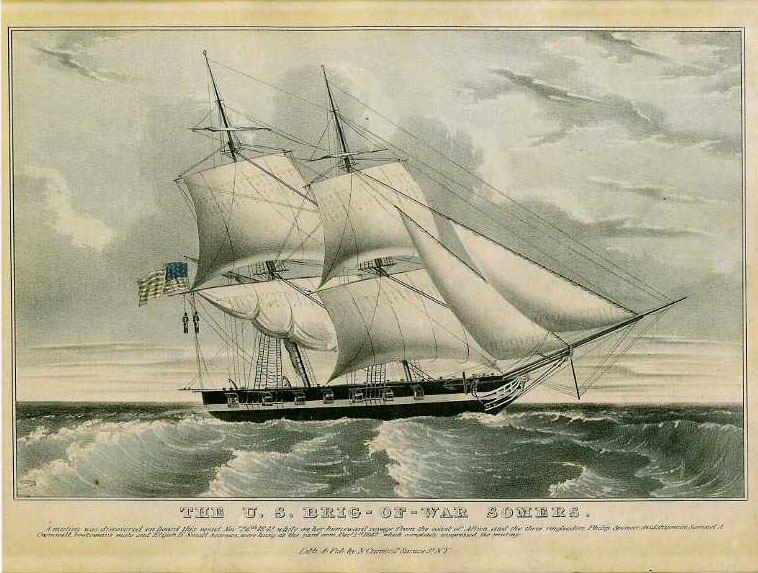 Text on the original, below the title line, reads: "Before the Intrepid had gained her Destined situation she was suddenly boarded by 100 Tripolines, when the Gallant Somers and Heroes of his Party, Lieuts. Wadsworth and Israel and 10 Men, observed themselves surrounded by 5 Gun-boats, and no prospect of Escape, determined at once to prefer Death and the Destruction of the Enemy, to Captivity & a torturing Slavery, put a Match to train leading directly to the Magazine, which at once blew the whole into the Air." U.S. Naval History and Heritage Command. “From the Halls of Montezuma to the shores of Tripoli” go the words to the hymn of the U.S. Marine Corps. The shores of Tripoli, Libya, are once again in the news, but there has been almost no reporting of 13 Americans left in mass graves there over two centuries. They are the men of USS Intrepid, lost in an action during the Barbary Wars, a conflict which in significant measure gave rise to the United States Navy. The infamous Barbary Pirates of the North African states of Tripoli, Morocco, Algiers, and Tunis menaced merchant vessels in the Mediterranean during the 18th and 19th centuries, capturing ships, demanding ransom for the return of the vessels and crew and later monetary “tributes” for their safe passage. American merchant ships, under the protection of the Royal Navy until the Revolution, and the French Navy until the Treaty of Paris, became vulnerable in the 1780s. With a nascent U.S. Navy, America paid the Barbary tributes until Thomas Jefferson reversed the policy in 1803, ordering a “squadron of observation” to protect American shipping off Tunis, Tripoli and Algiers. Commodore Edward Preble ordered the schooner Vixen and frigate Philadelphia to blockade the harbor at Tripoli. While chasing a Tripolitan vessel Philadelphia ran aground and was captured, its commander, William Bainbridge, and crew taken prisoner. To prevent the Philadelphia’s usage in Tripolitan hands, Lt. Stephen Decatur undertook a daring raid in February 1804. Posing as pirates using a captured Tripolitan vessel, Intrepid, Decatur and a crew of 80 managed to moor next to Philadelphia, surprise its Tripolitan crew, set it ablaze and return to Intrepid. Decatur’s success inspired another raid to destroy Tripolitan gunboats and influence the release of Philadelphia’s prisoners. On the night of Sept. 3, 1804, Capt. Richard Somers and a crew of 12 took Intrepid, loaded with seven tons of explosives, into the harbor, planning to ground her below the city, light fuses and get away. Instead, the vessel was detected by Tripolitans, fired on, and blown up, killing its commander and crew. Their remains washed ashore and the Tripolitan Pasha (king) Yusuf Karamanli reportedly ordered their corpses dragged through the streets then fed to a pack of wild dogs while prisoners of war from Philadelphia were forced to watch. The remains of the crew, which included second-in-command Lt. Henry Wadsworth, uncle of Henry Wadsworth Longfellow, were then dumped into a pit on the beach. Caputo has been involved in the Intrepid Project (Intrepidproject.org) since 2004 when he first heard the story of the ill-fated mission while on business in Somers Point, N.J. The town is named for the for the Intrepid captain’s father, a Revolutionary war colonel who served with George Washington. The Somers family petitioned for the repatriation of the Intrepid crew immediately following the Barbary Wars and for two centuries thereafter. However they were repeatedly denied by the State Department and the Navy, which has a tradition of leaving the fallen where they lie, as evidenced by the USS Arizona and the beaches of Normandy. “Of course none of those men were paraded through the streets, fed to wild dogs and then buried in a mass grave,” Caputo points out. An article written on the Intrepid in the 1970s for The American Legion magazine revived the repatriation effort, with the city of Somers Point joining, but no progress was made. Upon getting involved in 2004, Caputo suggested a different strategy. Negotiations with the Gaddafi Family Foundation and Saif-al Islam Gaddafi progressed to the point where Libyan archaeologists, previously unaware of the original beach grave site, dug there and confirmed the remains via bone and brass button evidence. Just as Caputo and Somers family members were about to board airliners for Tripoli in 2007, Israel went into Lebanon, and the negotiations were put on hold and subsequently lost momentum, in part due to unexplained opposition from the U.S. State Department. On March 10 of this year, the Intrepid group received a phone call from Congressman Mike Rogers-R Michigan, chair of the House Intelligence Committee. Rogers had been in Libya in 2004 as an Intel committee member and was pulled aside at an embassy function in Tripoli and told of a small military party buried in the Protestant Cemetary. He visited it and became devoted to returning the men. Rogers met with the Somers family and Somers Point civic representatives in April and introduced an amendment to the National Defense Authorization Act (HR 1497) ordering the repatriation of the Intrepid crew. The NDAA and the Rogers amendment passed on Thursday, May 26, and the full bill is now before the Senate. “This amendment has brought these gentlemen closer to their home than [they] have been in 207 years,” Michale Caputo says, although with some reservation. He does so because the Senate is known for stripping amendments from NDAA for later negotiation or dismissal. The Intrepid amendement is thus in jeopardy. The American Legion and the Henry Wadsworth Longfellow Estate have joined the Intrepid Project, urging members to contact senators to champion the amendment. The Intrepid Project is committed to raising private funds for the repatriation which could go forward when hostilities in Libya cease. The Senate will act on the NDAA in mid June. Congress and the American public want to know why we fight in Libya. While President Obama might have a hard time explaining it, to me it is quite clear. Those against US and military action seem to view Muammar Gadhaffi as a benevolent dictator, whose behavior is none of America’s business, a view that fails to take into account our mutual history. Ghadaffi is more reminiscent of Yusuf Karamanli, the Tyrant of Tripoli who pirated American merchant ships, enslaved their passengers and crews and demanded payment in millions of dollars in tributes and ransom. Americans responded with the motto, “millions for defense but not one sent of tribute,” and a reluctant Congress approved funds for the construction of ships and the founding of a Navy to fight the pirates. Under the command of Capt. John Barry, the “Father of the US Navy,” Stephen Decatur and Richard Somers were two of the first Midshipmen to enter the service, and became national heroes for their actions against the Barbary pirates. Other officers who distinguished themselves were Lt. Andrew Sterett, of the schooner Enterprise, who soundly defeated the pirate ship Tripoli in the first engagement, and Capt. William Bainbridge, who ran the frigate USS Philadelphia aground while chasing a pirate corsair into Tripoli harbor. Bainbridge spent the rest of the war with his 300 man crew as Karamanli’s prisoners in the dungeons of the old castle fort. Today these heroes are remembered by the ships named after them - the USS Sterret is patrolling off Africa, the US Navy SEALS shot pirates from the deck of the USS Bainbridge and the USS Barry launched missiles in the first round of the UN backed NATO attack against Gadhafi forces in Libya. Cynthia McKinney once represented Decatur, Georgia in Congress, while Condi Rice visited Ghadafi in Tripoli two hundred and four years to the day that Richard Somers was killed in the explosion of the USS Intrepid in Tripoli harbor. The aircraft carriers Enterprise and Intrepid were named after their Barbary war counterparts. 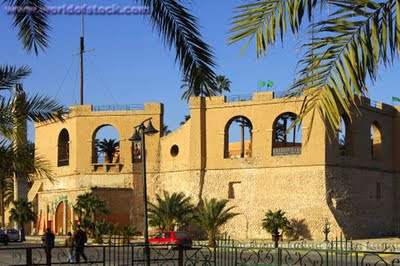 The old castle fort is now a museum that includes, beside ancient Roman artifacts, the Volkswagon that Col. Gadhafi drove into Tripoli during his 1969 coup. We are historically doomed to compare the revolution in Libya to Iraq or Afghanistan, as the US military has made it quite clear that the lessons of Iraq will prevent them, at least in our lifetime, from invading any country with the intention of occupying it, as that is a mission they will not accept. What we will see is an increase in the number of missions like the one undertaken by the US Navy SEALS to kill Osama Bin Laden, small special operations with clear and achievable missions. Not unlike the one undertaken by William Eaton and Pesley O’Bannon, eight marines and a ragtag army of volunteers and mercenaries that resembles the rebels fighting Gadhafi today. Just as T. E. Lawrence and his motley band marched across the desert and took Akaba from the defenseless rear, Eaton’s small army took the eastern port city of Derna in a battle that lasted a little over an hour. After repulsing a counter-attack by loyalist forces, they were about to march on Tripli, when American diplomat Tobias Lear agreed to a treaty with Youseff Karamanli to free Capt. Bainbridge and his men for a payment of ransom. That treaty went against the principles they were fighting for, betrayed those Libyans who fought with us, and left Karamanli in power. When the Navy held a ceremony at the graves of the Intrepid men in 1949, Prince Karamanli was part of the proceedings. Now the United States, which had previously supported the entrenched dictatorial Arab regimes because of their support of America’s foreign policy, is pledging support for the revolutionaries, possibly completing the unfinished march on Tripoli that Eaton and Presley began over two hundred years ago. America goes to Tripoli, not for oil or bases, but to support the principles that were the basis for the American Revolution, principles that have been taken up by the Arab youth today – economic freedom, liberty, justice and democracy. When the revolution gets to Green Square, and it is renamed Martyr’s Square, in honor of all those who have died fighting for these ideals, the only real martyr’s actually buried there are Americans - US Navy Master Commandant Richard Somers and the men of the USS Intrepid. We go to Tripoli to rejoin the American revolution. 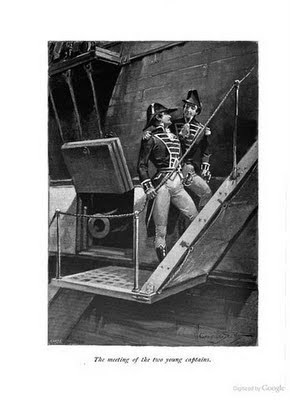 Alleged Mutineer Midshipman hang from the yardarm of the USS Somers in this lithograph. The second of six US Naval ships named after Master Commandant Richard Somers, was used to train Midshipman as officers. Given the fact that Somers, and his Philadelphia Free Academy schoolmate Stephen Decatur were two of the first Midshipmen appointed to the US Navy and assigned to the frigate USS United States under Capt. John Barry, the Father of the US Navy, it was appropriate that such a ship be named after Somers. But during one of its voyages, three of the young men were hung for mutiny, including the son of the Secretary of War, an incident that led to the end of training of Midshipmen at sea and the founding of the US Naval Academy at Annapolis, Maryland. The story of that mutiny also inspired Herman Melville to write one of his best known works, "Billy Budd," based on recollections of a relative who was on the ship. The USS Somers later sunk in a storm off Mexico, but its wreck was discovered by American divers and its location kept secret so it would not be stripped by scavengers. The same crew who discovered the Somers also planned on searching Tripoli Harbor for the wrecks of the frigate USS Philadelphia and the USS Intrepid, both of which sunk close to shore in 1804 during the first Barbary War. The only known US Naval mutiny in documented history ended in 1842 with three mutineers having their necks prematurely lengthened. The USS Somers was a brand new 259 ton, 100-foot brig which mounted ten 32-pounder guns and carried 120 sailors. She was serving an experimental training ship as there was no naval academy at the time and as such included several teenaged midshipmen in her crew. After a quiet summer cruise to Africa the ship's captain, Commander Alexander Slidell Mackenzie (who was also a well-published author and a personal friend of Washington Irving) and mate Lieutenant Guert Gansevoort, a career officer from an aristocratic Dutch-American family (his father was a brigadier general and had served in the Continental Army) were told that a mutiny was afoot. The center of this plot was seventeen-year-old acting Midshipman Philip Spencer. It was thought that Spencer, along with two sailors, Boatswain's Mate Samuel Cromwell and Seaman Elisha Small, were planning to seize the ship and then kill any who opposed them before turning it into a pirate ship. This charge was supported when Mackenzie ordered Spencer seized after Gansevoort found him studying a map of the West Indies and asking questions about navigation. When Spencer’s cabin was searched a scarf was found with a list of names written in Greek of those of the crew who would be kept after the mutiny as well as drawing of the USS Somers flying a pirate's flag. This led to Small and Cromwell's arrest the next day and their subsequent captain’s mast (courts marshal at sea). The defendants were unanimously found guilty by the panel and ordered hanged three days later. On December 1st, 1842 at 1:45 in the afternoon the ship's crew was called to attention. The defendants were tied to the ship's yardarms and heaved aloft while the ship's ensign was raised above them. All hands were ordered to cheer three times to salute the flag. The mutineers were left to dangle in the sails until 3:30 and were then committed to the sea at dusk. The teenaged Spencer was the son of Secretary of War John C. Spencer and an inquiry and scandal ensued as soon as the USS Somers hit port. Commander Mackenzie, a naval veteran of some 27 years at sea, was tried at courts marshal for murder as well as eight other charges and fully exonerated. The U.S. Naval Academy was established October 10, 1845 in response to this scandal and the practice of training midshipmen at sea. The scandal colored Mackenzie's career and he died just six years later at age 45. The USS Somers herself did not outlive Mackenzie, being lost in a sudden squall in 1846 while under command of Raphael Semmes, who went on to become the Confederate navy's most famous officer. Th US Navy, who often recycles warship names, has had four subsequent ships (all destroyers) named USS Somers on the navy list as recently as 1988. Letter from ZB file concerning ancestry. Your letter of May 20, requesting information concerning the ancestry of Commander Alexander Slidell MacKenzie has been referred to this office for reply by the Bureau of Navigation. Particulars as to the parentage, etc., do not form a part of the early records of the Navy Department. Such information, if available at all, is usually obtained from incidental reference in correspondence or from outside sources. I shall be glad to give you what we have, which, however is very little. The biographical sketch of Alexander Slidell MacKenzie in the recently published Dictionary of American Biography states that he was born April 6, 1803, and that he was the son of John Slidell, a New York merchant, and Margery or May MacKenzie, a native of the Highlands of Scotland, and a brother of John Slidell, the Confederate diplomatic agent. The Navy Department records show that he was warranted Midshipman in the U.S. Navy on January 1, 1817, with a number of other young men, and that his warrant, with those of quite a few others, was delivered that month to "Dr. Marshall". We have not traced the identity of "Dr. Marshall", but it is quite possible that he may have been Surgeon Samuel R. Marshall. The records show also that he was born in and a citizen of the State of New York. He accepted the appointment, apparently in March 1817, but we unfortunately do not have his letter of acceptance. At the time of his appointment and up to May 9, 1817, he was attached to the U.S.S. Java, Captain Oliver H. Perry. He accepted the appointment, apparently in March 1817, but we unfortunately do not have his letter of acceptance. The date of his appointment as Midshipman is given in the navy Registers, 1817-1821, as January 1, 1817, but beginning with 1818 is changed to January 1, 1815. In searching for a reason for the change of date of appointment from 1817 to 1815 a letter from his father, John Slidell, Esq., to the Navy Department was found, written from New York, October 17, 1817, stating he had just been informed that the U.S. Brig Enterprise, on which his son was then acting as Midshipman, was ordered on foreign service. The letter went on to say that he had been an acting Midshipman for 31 months (which would date the beginning of his service as about March 1815), and had during that time been twice to the Mediterranean, and the last summer attending the survey of the coast; that he was very young, and that he (the father) was desirous that he should perfect himself in French and mathematics, in which studies he was then engaged, and if consistent with the views of the Department he would be highly gratified in his being attached to the U.S.S. Cyane. The above letter clears up the question of the change of date in his appointment, although we find no letter to either Midshipman Slidell or his father relative to it. The name of MacKenzie was added to that of Slidell by Act of the Legislature of New York in either 1837 or 1838. We find only two references to this change of name. the first is a letter from him to the Secretary of the Navy, written from the U.S. Brig Dolphin at Rio de Janeiro, Brazil, December 27, 1837, informing him that an application was before the legislature of the State of New York praying that he might be allowed to assume his maternal name of MacKenzie in addition to that of Slidell in order to qualify him to inherit property, and asking that he might be permitted by the Department to be so known in the Navy, and to take the additional name whenever authorized to do so by the legislature. The Second is the Secretary's reply, dated March 13, 1838, informing him that the additional name of MacKenzie had been sanctioned by the Legislature of New York, and he would be known henceforth by the Department as Alexander Slidell MacKenzie. Commander MacKenzie died suddenly September 13, 1848, at his residence, near Tarrytown, N.Y., of heart disease. The Department was notified of his death on September 14, by Captain Isaac McKeever, Commandant at New York, who stated that he had been informed of it by Commodore Matthew C. Perry. Labels: Mutiny Also Inspired Melville's "Billy Budd." GALLOWAY – He's not sure exactly where, but Collin Wiener's Eagle Scout project has helped clear a place for Master Commandant Richard Somers' final resting place. The Troop 77 Scout spent some time wondering what his project was going to be. Then his father, a Navy veteran of Iraq, went to the local Veterans Administration office and asked if they had any projects on their agenda. Collin, son of Jeanine and Brian Wiener, was immediately directed to the Somers Cemetery in Somers Point. It needed some help as it is only cared for by volunteers, VFW members, and members of the Somers Point Historical Society – specifically Sally Hastings, director of the society, according to Collin Wiener. "It sparked my interest because he was on the news," said Wiener, 16. The project was special to all the participants because they were aware of Somers' story. On Sept. 4, 1804, Somers assumed command of the USS Intrepid, which had been fitted out as a "floating volcano" to be sailed into Tripoli Harbor, Libya, and blown up in the midst of a pirate fleet under the walls of the city. But as she was getting under way the ship exploded prematurely, killing Somers and his entire crew of volunteers. Somers is buried in a mass grave near Tripoli. In 2004, the New Jersey state Assembly passed two resolutions calling for the return of his remains. Now the United States Congress is passing similar resolutions. Through the work of Wiener and his fellow Scouts, the local cemetery is ready and waiting. "We were seven Scouts, one parent and one scoutmaster," Wiener said. "We cleaned up and constructed a set of railings. I was amazed. One of our scoutmasters, Dave Vedral, works in carpentry." The soon-to-be Eagle said he learned a lot about Richard Somers and also learned a lot reading the gravestones in the cemetery, which is hidden under tall trees along Somers Point-Mays Landing Road and is not well known except to those who live in the neighboring Greate Bay Villas. The burial ground is the resting place of descendents of John Somers, founder of the Somerset Plantation that grew to be Somers Point, and has more than 30 stone markers, Wiener said. Some display inscriptions from the mid-1700s, while some remain mysterious as to their dates. "I learned a lot reading the gravestones," he said. "They were really interesting." The Absegami High School sophomore who swims and plays lacrosse said the development of a nearby golf course, homes, and a townhouse complex have left the cemetery untouched. "The site deteriorated over time despite occasional maintenance work, and the decline was evident, from fallen or vandalized headstones to the damage to fences from overgrown vegetation," he said. Officially, no one owns the land. Historical Society President Hastings said the deed is still in the name of the Somers family and that the recent volunteer efforts have improved its appearance. The team was led by Wiener and Vedrel. 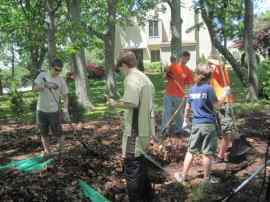 The group cleared weeds, removed several large tarps full of leaves, cleaned the adjacent roadway and constructed railings to a set of previously constructed steps. "The experience taught me a lot about responsibility, planning, and leading," Wiener said. The Arab revolutions that are sweeping across North Africa and the Middle East center around the public square in each city, and in Tripoli, that is Martyr’s Square, which was renamed Green Square when Mohmmar Gadhafi assumed power in a 1969 coup, but will assume its original name of Martyr’s Square after Gadhafi is gone. But the only real martyrs actually buried at Martyr’s Square are eight American sailors, three officers and five men who died in the explosion of the USS Intrepid in Tripoli Harbor on September 4, 1804. Their commander, 25 year old Master Commandant Richard Somers, was born in Somers Point, New Jersey, the son of a Revolutionary War colonel and privateer captain who attended the Philadelphia Free Academy with Stephen Decatur and Charles Stewart. When President Washington ordered Captain John Barry, the Wexford, Ireland born “Father of the US Navy” to prepare some young men to be officers in the new US Navy, he chose Stewart as his first officer and Somers and Decatur as his Midshipmen. A reluctant Congress finally approved financing for a Navy when North African Barbary Coast pirates began plundering American merchant ships, ransoming their crews and demanding tribute to stop the practice. Instead, Americans responded with the cry, “A million for defense but not one cent for tribute,” and built a fleet of frigates and schooners to fight the pirates. Somers, Decatur and Stewart served under Capt. Barry on the USS United States, built in Philadelphia. Lt. Andrew Sterett aboard the schooner USS Enterprise was the first to encounter a pirate ship and won the engagement handily. Lt. Decatur was then given command of the Enterprise while Somers had the schooner USS Nautilas, both capturing pirate prizes, including a ketch they rechristened the USS Intrepid. Unfortunately, the frigate USS Philadelphia ran aground while chasing a pirate coarser into Tripoli harbor and the ship and its 300 man crew, including Captain William Bainbridge and Lt. David Porter, were taken prisoners and held in the dungeons of the old castle fort. Under the command of Captain Edward Preble, Somers and Decatur each led flotillas of gunboats against the pirate fleet in Tripoli harbor, and Decatur led a commando team into Tripoli harbor at night aboard the Intrepid, recaptured and sunk the Philadelphia and escaped without any casualties. The success of that raid led Preble to approve another plan, to outfit the Intrepid with explosives as a fire ship, sail it into Tripoli harbor at night, aimed at the anchored enemy fleet, light a fuse and escape in row boats. But something went terribly wrong, the Intrepid exploded prematurely killing all thirteen men, who were found washed ashore the next day. Their bodies were identified by the surgeon from the Philadelphia, and buried by a party of prisoners, “one cable’s length” (270 yards) east of the walls of the old castle fort, in two nearby but separate graves, one for the three officers and one for the ten seamen. Besides Somers, the officers included Lt. Henry Wadsworth (uncle of Longfellow), the first officer, and Lt. Joseph Israel, who had come aboard after they had gotten underway and requested permission to stay aboard, the unlucky 13th man. They were buried on the shores of Tripoli, and there they remained, until 1930, when an Italian army road work crew uncovered the remains of five of the men. They were reburied about a mile away in what is known as Old Protestant Cemetery, a walled enclosure that also includes the remains of about a hundred others, mainly Christians from various European embassies who died there. In 1949, the USS Spokane put into Tripoli harbor, and honored those buried at the cemetery site with a formal ceremony, that included a bagpipe band and the mayor of Tripoli, Yousef Karamanli a namesake and a descendent of the Yousef Karamanli who led the pirates two centuries ago. 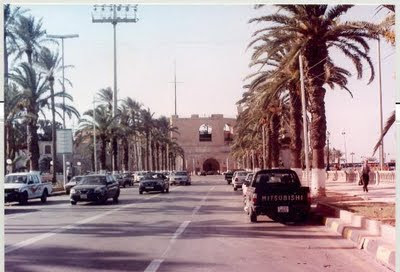 Throughout the fifties and sixties, the cemetery site was maintained by the Officer’s Wifes Club of nearby Wheelus Air Force base, but the US military were forced out when Mohmmar Gadhafi assumed power in a 1969 coup. The cemetery site was then forgotten about and was overgrown with weeds and debris when two American tourists stumbled upon it, and wrote about it in American Legion Magazine (May, 1977). The article inspired many Americans, especially veterans and family descendents of Richard Somers and Henry Wadsworth, and they sought the repatriation of the remains of these men and the eight others who are buried in the original grave site outside the castle walls in Martyr’s Square, which Mohmmar Gadhafi had renamed Green Square. By the 1980s however, the United States was practically at war with Gadhafi, who was held responsible for terrorists attacks against American soldiers in Europe. In response the United States bombed Tripoli, and hit Gadhafi’s tent, killing his adopted daughter. When relations between Libya and the United States later thawed after the turn of the century, members of the Somers family and Somers Point officials personally asked Gadhafi to allow for the return of the remains of these Americans, and he agreed. It was the United States Department of Defense and the US Navy who balked. All of their studies of the cemetery site indicated it was a secured and well marked site, and should be the permanent resting place for those men. In 2011 however, after the Arab revolution spread to Libya, and Green Square became a rally point for the pro-Gadhafi demonstrators, the original grave site once again came into primary focus, and Rep. Frank LoBiondo (R. NJ) asked for assistance from Rep. Mike Rogers (R. Mich), the powerful head of the House Intelligence Committee. In April 2011 Rogers, a veteran himself, introduced a House Resolution that called for the Secretary of Defense to do whatever is necessary to repatriate the remains of the American military in Tripoli. And ater the national directors of the American Legion endorsed the measure, Rogers attached the resolution to the Defense Appropriations Act, which was passed by the House in early May and is now being considered by the Senate. After Gadhafi is gone, Green Square will be renamed Martyr’s Square for the tens of thousands of young Arabs revolutionaries who died fighting tyranny, and for freedom, justice and democracy – the same things that Somers, Wadsworth, Israel and the men of the Intrepid died for over two centuries ago. When the revolution gets to Martyr’s Square in Tripoli, remember the officers and men of the Intrepid, and the fact that they are still buried there in unmarked graves, and should be repatriated home so they can be properly buried with full military honors. An Open Letter to Sen. John McCain (R. Az). 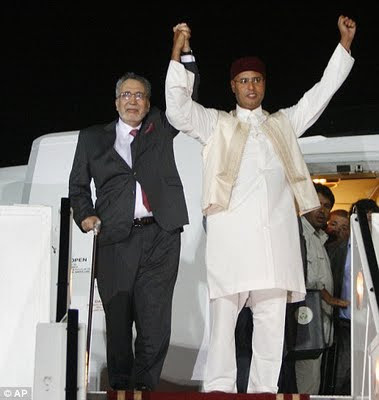 Convicted Lockerbie terrorist Abdel Basset Ali Megrahi and Saif Gadhafi receive a hero's welcome in Tripoli after Ali Megrahi was released from Scottish prison on humanitarian grounds. As chairman of the Senate Armed Services Committee you are considering the Defense Authorization Bill, which includes the Rogers/LoBiondo Tripoli Repatriation amendment (H.R. 1540) that was passed by the House. US Navy Master Commandant Richard Somers left Somers Point, New Jersey to fight pirates and the Tyrant of Tripoli, and for freedom, liberty, justice and democracy - the same things that the American military and the Libyan rebels fight for today. Somers died in the explosion of the USS INTREPID in Tripoli harbor on September 4, 1804 while on a secret mission to destroy the anchored pirate fleet. Lt. Henry Wadsworth (Uncle of Longfellow), Lt. Joseph Israel and ten US Navy volunteers were with him. Their bodies washed ashore, and after being mauled by dogs, they were buried by the prisoners from the captured frigate USS PHILADELPHIA, just outside the walls of the old castle fort in Martyr’s Square, the epicenter of the revolt in Tripoli today. When you were in Tripoli, you met with Saif Gadhafi, and requested they not hold a celebration when convicted Lockerbie terrorists Abdel Basset Ali Megrahi was freed, but despite your pleas, they did, and the hero’s welcome he received led to the deterioration of the relations between Libya and the United States. Now, we have the opportunity, as soon as Gadhafi leaves power, to repatriate the remains of Somers and the men of the INTREPID, and to give them the hero’s welcome home and proper burial with full military honors that they deserve. 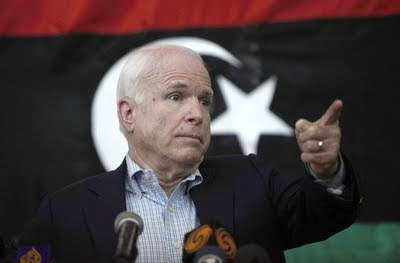 Thank you for supporting the Libyan rebels, and please support the Rogers/LoBiondo amendment to the Defense Authorization Act, and return the remains of our heroes, who were left behind enemy lines and are the only martyr’s buried in Martyr’s Square, Tripoli. The Rogers/LoBiondo Amendment to the Defense Authorization Bill calls for the repatriation of the remains of American servicemen from Libya, specifically the men of the USS Intrepid from Martyr's Square in Tripoli. This bill is now being considered by the Senate Armed Services Committee(SASC), whose chairman is Sen. John McCain. Now YOU can do something to help repatriate the remains of American Naval Heroes from Tripoli by helping to convince Sen. McCain, his committee and the 100 members of the U.S. Senate to keep the Rogers/LoBiondo Amendment as part of the Defense Authorization Bill. Rep. Mike Rogers (R. Mich.) is the champion of the Tripoli Repatriation Act - having introduced the resolution in the House of Representatives which requires the Secretary of Defense to do whatever is necessary to return the remains of American servicemen in Libya. While we expected it to take many months to get the necessary co-sponsors and support, Rogers is the highly respected chairman of the House Intelligence Committee, and only someone with that authority and respect can do what he did - attach the resolution to the Defense Authorization Act. He then pitched the House Rules Committee to keep it there, which they did. So it passed the House when they approved the Defense Authorization Act, which is now being reviewed by the Senate. Just as the House Rules Committee eliminated many of the 200 some amendments that were attached to the Defense bill, the Senate Armed Services Committee will do the same, and go over the bill with a fine tooth comb and eliminate what they want out and keep what they want in, and then let it be voted on by the full Senate. They will do this before they adjourn for the July 4th holiday, probably before Friday, June 17th, less than two weeks away. Rep. Frank LoBiondo (R.NJ), who has represented Somers Point, NJ for many years, and has been our biggest supporter in Congress, asked Rep. Rogers to take up this cause, and so the amendment is being referred to as the Rogers/LoBondo Amendment. What we need to do is to get the same support in the Senate that we got in the House from LoBiondo and Rogers, and to do this we need a very strong letter writing campaign asking for their support. Letters from Somers and Wadsworth family members carry more weight, as do letters from constituents, so if you write your Senator asking him to support Rogers/LoBiondo Amendment to repatriate the remains of our servicemen from Tripoli, it will get their attention. Letters should be faxed to DC and mailed to the Home State Office - because snail mail sent to DC is withheld for a week or two while it is checked for anthrax, and that will be too late. Fax and phone calls are best, and emails and comments sent via Senator's web pages will help too. Letters to the Department of Defense will be helpful, especially to Gen. Martin Dempsey, the new Chairman of the Joint Chiefs of Staff, Sen. Harry Reid, Majority Leader in the senate, and Sen. Mitch McConnell, Minority Leader in the Senate. The most important Senators are the members of the Senate Armed Services Committee - Room SR-228, Russell Senate Office Building, Washington, D.C. 20510-6050 (202-224-3871), whose chairman and ranking member is John McCain (R.Az) and Carl Levin (D. Michigan). Please write, Fax and phone these Senators and tell them that you think 200 years is too long for the remains of American Naval heroes to be left behind enemy lines and in the hands of pirates, and to bring them home. Short, one page letters are enough, and get right to the point, inform them of the situation, and ask them to help remedy this injustice. On Memorial Day, President Obama honored two US Marines, Lt. Travis Manion and Lt. Brendan Looney, who were roommates at Annapolis, became best friends, Marines, SEALS, died in combat and are now buried together at Arlington National Cemetery. Manion's body was exhumed and reburied next to his friend. Their story is reminiscent of two other young men – Richard Somers and Stephen Decatur, who were best friends, schoolmates, enlisted in the Navy together and fought beside each other in battles against the Barbary pirates. Like Manion, of Doylestown Pa. and Looney from Maryland, Somers and Decatur were from local military families, both sons of Revolutionary war privateers, and went to school together at the Philadelphia Free Academy with Charles Stewart. As young students Somers and Decatur were said to have often engaged in fist fighting in the cemetery behind Independence Hall, where Commodore John Barry is now buried. When President Washington commissioned John Barry the first officer of the new, reconstituted US Navy, he ordered him to select young men to train as officers, and the Irish born Barry, "Father of the US Navy," selected Stewart his first officer and Somers and Decatur as Midshipmen. In effect, they were the first class of midshipmen in the US Navy. Because they were so close, Somers and Decatur often derided each other, which caused five other young officers to question their character, and Somers was challenged to a duel with all five. After Somers wounded three of them, and taking a shot in the arm, Decatur is said to have held up Somers arm so he could shoot, and the others backed off. Honor sustained. After serving with Barry aboard the frigate USS United States, built at the South Philadelphia Navy Yard, all three men were given command of their own ships and sent off to fight the Barbary Pirates. Somers in the schooner USS Nautilus and Decatur taking command of the schooner Enterprise, quickly engaged pirate ships in action, Decatur capturing a ketch he took as a prize and rechristened the USS Intrepid. Unfortunately, while chasing a pirate corsair into Tripoli harbor, Capt. Bainbridge ran the frigate USS Philadelphia aground, and surrendered his ship and 300 man crew were taken prisoner and held for a million dollars ransom by the tyrant of Tripoli Bashaw Youseff Karmanli. In a daring nighttime raid, Decatur sailed the Intrepid, disguised as a pirate ship, into the harbor, recaptured the Philadelphia and set her ablaze and escaped without any casualties. During two separate battles of Tripoli, Somers and Decatur each led flotillas of gunboats against the pirate fleet with much success, though Stephen Decatur's younger brother James was killed. 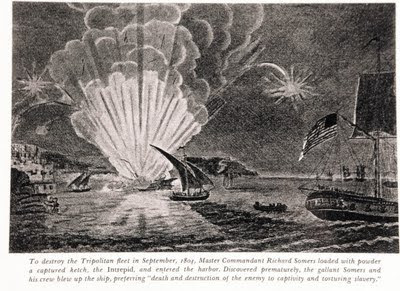 Then Richard Somers was given command of the Intrepid, and they outfitted it with explosives as a fire ship, with the intention of sailing it into Tripoli harbor at night, aiming it for the anchored pirate fleet, lighting a fuse and escaping in row boats, but something went terribly wrong and the ship exploded prematurely killing all aboard. 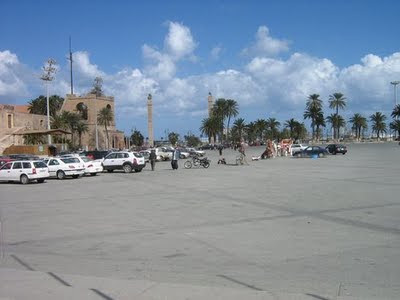 The remains of Somers and his men washed ashore the next day and they were buried by prisoners of the Philadelphia, and the remains of Somers and the officers and five men are still buried at Green Square (Martyr's Square), which is the center of the Libyan revolt. Decatur helped defeat the pirates and persuade Karamanli to agree to a treaty, which was broken a few years later. Decatur then played a major role in the Second Barbary War, and the War of 1812. Decatur was very popular for his military victories and helping to establish the style and traditions of the US Navy. He was considered presidential material and was being drafted to run for president. When John Barron surrendered the frigate Chesapeake, Decatur had called him a coward, and for years, almost a decade, the two men quarreled, until finally Barron challenged Decatur to a duel. They met at the old dueling spot in Maryland, just beyond the District of Columbia border, and both men were wounded, but Decatur died the following day. He was buried in Philadelphia, while his wife continued to live in their home, the Decatur House, just around the corner from the White House that is still there. When Decatur's widow died she was buried in Washington, on grounds that was to be used for a University expansion, so in the 1980s she was exhumed and reburied in Philadelphia next to her husband. Somers and Decatur were so close that when a book was written about gays in the military, a chapter on Somers and Decatur implied they were lovers, but Somers had a girlfriend and Decatur was married, so their relationship was certainly not sexual as the book falsely intimated. But rather, they were best of friends, schoolmates and warriors together, just like Lieutenants Travis Manion and Brendan Looney. A book that is said to be required reading at Annapolis is called "Somers and Decatur," and written by Molly Elliot Seawell in an entertaining style that has inspired and encouraged other young men to enlist in the Navy, see the world and fight pirates. Somers and Decatur were well known heroes in their day, and many city streets and Navy ships have been named after them. Six Navy ships have been named after Somers, including the USS Somers that was used to train Midshipmen at sea until three young men were hanged for suspected mutiny and the US Naval Academy was founded at Annapolis in the wake of that scandal. The cities of Decatur, Georgia was named after Stephen Decatur and Somers, New York was named after Richard Somers. And now, just as Decatur's widow and Lt. Manion were exhumed from their graves and reburied next to their husband and friend, the remains of Somers should be repatriated home from Martyr's Square in Tripoli and reburied among his family and friends in Somers Point.